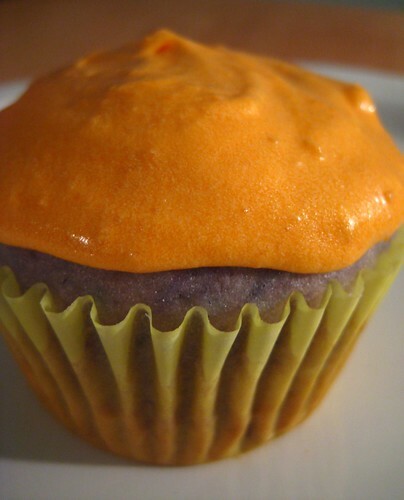 Blondie and Brownie: Orange You Glad Baseball Season's Here! Orange You Glad Baseball Season's Here! Tonight's the official opening night of CitiField, with the Mets vs. Padres game at 7:10pm. Seeing as making cupcakes is one of the few ways I know to celebrate a major life event, I made some for today! Blueberry cake with an orange-tinted lemon frosting to be exact. 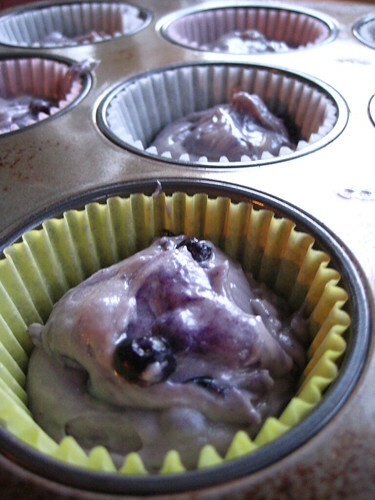 Finding a blueberry recipe was a bit tricky, there aren't many available. After much searching, I decided to try this recipe from Cupcakes and Crinoline, which in turn comes from Cupcakes Galore by Gail Wagman. 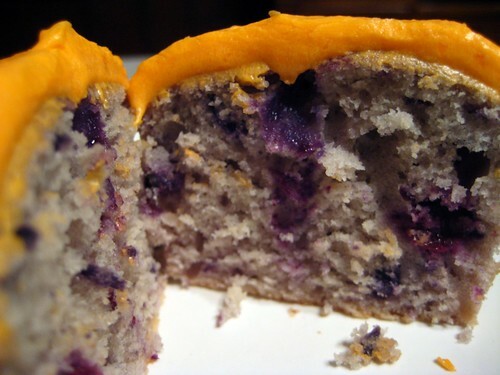 The batter seemed fine enough, a bit on the drier side than other batters, but with 3/4 of a cup of blueberries added in, some frozen, I suspected that would add enough moisture into the cake. My suspicions were only partly true. The cake is moist, but not enough as I'd like it to be. 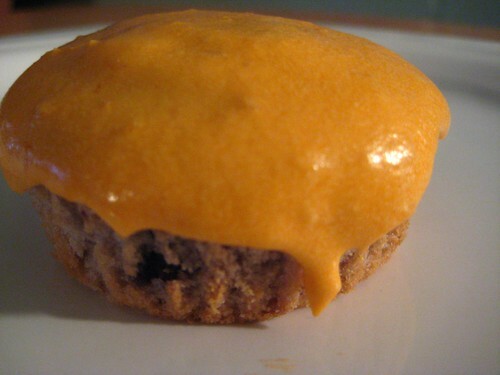 The finished product is more like a muffin than cake (yes, a cupcake is more than a muffin with frosting.) If I do this recipe again, I will consider adding in more fat and sugar. Then I had a frosting debacle. Blueberry and lemon wasn't my first choice, but I couldn't avoid that it's a tried and true flavor combination. I came across David Lebovitz's Almond Layer Cake with Lemon Frosting. David Lebovitz is a pastry deity, therefore I take any recipe he gives out as the word. I disregarded the cake and took the frosting. Now, I know some of the following problem may have come about due to my own impatience, and the cupcakes might not have been fully cooled. Regardless, I am not in love with this frosting. Personally, I don't like cloyingly sweet frosting, so I did David's recipe using only 3 cups of sugar instead of 3 1/2. This is what happened. Runny, drippy, cloying frosting. Not awesome. I knew I didn't want to put in any more sugar, instead I reached for the only thickener I have, cornstarch. This may get you yelled at by Martha when on Top Chef, but it's damn good at thickening and canceling out some of the sweetness. The resulting frosting is thicker, not as fluffy as I'd hoped, but passable and edible. I know the orange color with a citrus taste will throw many people off, that's an experiment similar to purple ketchup. As long as my boys win today, and David does really well, I'll be happy. 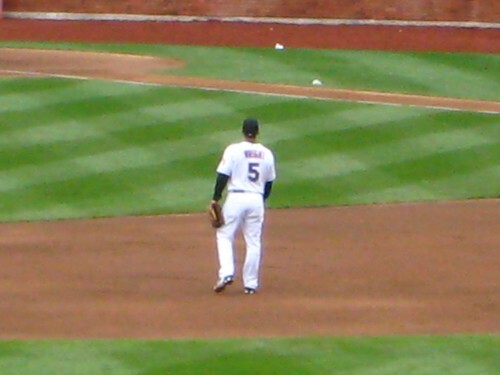 Don't tell me you thought I wasn't going to be including my gratuitous shot of Mr. Wright. Are these just commemorative or are you bringing them tonight? Ahem, donde esta mi cupcake?! Were you at Citifield last night? The new apple is lame. At least the old one is still there, albeit hanging out by the visitors' bullpen. Have you had any of the Brooklyn Brewery beers? I had the Blanche de Queens (at Box Frites) and it tasted a lot like their Hefeweizen. Next time I go I'm definitely getting the Sabroso ale @ Verano Taqueria. Oh, and next time I go hopefully the Mets win. @Caryn: They were just for the Mets fans I work with. @Brownie: You know you have to reserve one when menfolk are involved in the eating! @Roopa: No, fortunately. I did have two of the beers when we went for the exhibition game two weeks ago. I liked the Taco beer better than the fries beer. I will do a full round-up next game, promise. Free Cone Day and 50 cent Iced Coffee Day! Farewell Amai, We Hardly Knew Ye! Churros at the Doughnut Plant?! Eat and Learn at Woorijip! Cupcake Camp Comes to NYC!